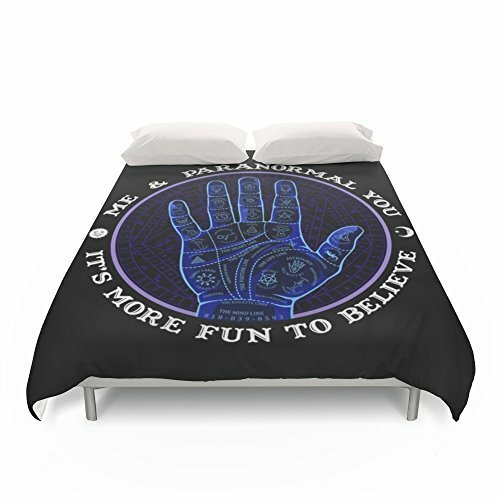 Society6 Me & Paranormal You - James Roper Design - Palmistry (white Lettering) Duvet Covers Full: 79" x 79" by Me & Paranormal You. Cover yourself in creativity with our ultra soft microfiber duvet covers. Hand sewn and meticulously crafted, these lightweight duvet covers vividly feature your favorite designs with a soft white reverse side. A durable and hidden zipper offers simple assembly for easy care - machine washable with cold water on gentle cycle with mild detergent. Available for King, Queen and Full duvets - duvet insert not included. *Queen duvet works for Twin XL beds.